← And back in the greenhouse . 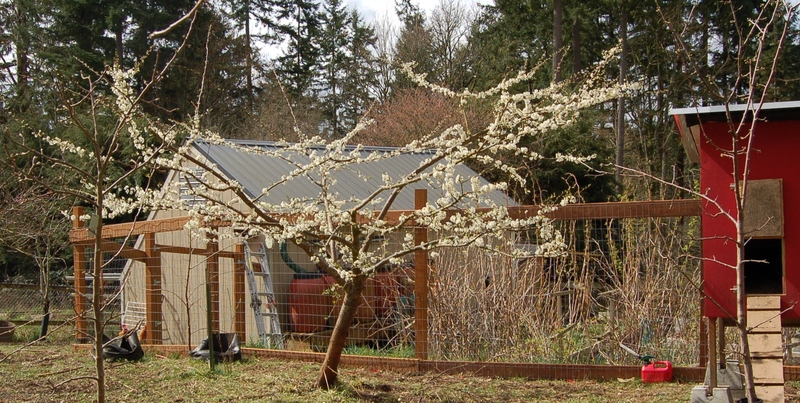 . .
Our Shiro plum tree is our more prolific and reliable tree. The tree is about 7 – 8 years old now and produces heaps of super juicy yellow plums each year. What you see in the picture is the “after” shot. We pruned this tree pretty hard last week (yes, very late I know). I took out most of the center growth and pruned it into a fan shape for easier picking. Also showing nice spring growth: the blueberries. We have a few dozen bushes around our yard and they are all leafing out nicely. The peas are emerging and starting to show some good growth. I intentionally over-planted the peas so I can harvest some of the baby pea shoots for a nice stir fry. In just a few short weeks, the rhubarb has put on a great amount of growth. I should have enough to harvest a decent amount this year. Also showing impressive growth is the garlic. This is another plant I over-planted so I can harvest spring greens. This entry was posted in Gardening and tagged blueberries, garlic, peas, plums, rhubarb. Bookmark the permalink. Your peas and your rhubarb are a little further along than mine – but both are up for us too. Garlic patches look to be at about the same stages with each other. The Shiro plum looks beautiful. The pruning looks well done as the shape of the branches is very open and outward reaching. Looks like spring is really displaying her magic at your homestead! What a beautiful plum tree, Sandy! I look forward to seeing our baby ones grow that big. So exciting to see everything starting to really shoot up as the temperatures FINALLY warm up. I can really see what a difference that little bit of latitude makes, too; we’re not that far north of you (I don’t think!) on Vancouver Island, but your rhubarb and blueberries are a couple of weeks ahead of us. Hope we catch up soon!